The common bean (Phaseolus vulgaris L.) is a major food legume cultivated by smallholder farmers in the tropics of Latin America and eastern and southern Africa. Acid soil and high temperature limit its production. Here we quantify differences in agronomical, phenological and physiological performance of common bean lines in order to identify promising lines with adaptation to acid soils and high temperatures in the Amazon region of Colombia. A field study was conducted using a 6 × 6 Alfa Lattice design with four replications consisting of 30 genotypes and one control genotype (Calima) which was repeated six times in each block (with a total of 36 plots) to cope with the spatial variability within the experimental site. During the growing period of the crop, maximum and minimum average temperatures were 32 and 23 °C, respectively while the total precipitation was 933 mm and the soil was acidic with aluminum toxicity. Differences in agronomical (grain yield, canopy biomass, number of seeds and pods per area), phenological (days to flowering and days to physiological maturity) and physiological (biomass partitioning, photosynthetic ability and pollen viability) attributes among the genotypes tested were quantified. 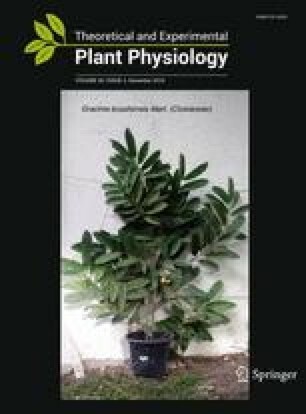 The results obtained on the relationships between different plant attributes indicated that adaptation to acid soils and high temperatures is related to pollen viability, earliness, greater values of canopy biomass and better mobilization of plant reserves to the formation of pods and grains. Two common bean lines (BFS 10 and NCB 280) were identified as better adapted to the combined conditions of acidic soil and high temperatures in the Amazon region of Colombia.